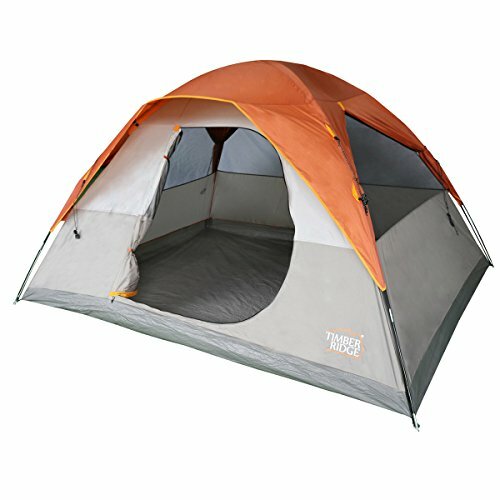 The TimberRidge TRWF110972RU family camping tent special designed 'D' style door for easy entry and exit. Zippers on fly and interior mesh panels offer maximum ventilation and comfort. Hooped polyester fly provides extreme weather protection(except waterproof). The polyester fabrics on the fly and walls are rugged and durable. High strength fiberglass frame with pole pockets makes sure for good stability, which surely makes any camping trip a nice experience. It comes with its own carry bag which is great for storage. Timber Ridge is a professional outdoor brand which devotes to provide best outdoor experience for customers. Our products cover different fields on outdoor activities including bags, tents, wagons etc. All the products are subject to multiple strict quality tests on different extreme environments before entering market. We have reasons to believe our quality products will meet all the needs on outdoor activities. Customer satisfaction always is an eternal target of Timber Ridge. We pursuit a balance between customers and products on price and quality to ensure a perfect experience for all the customers.